ST spacers are mounted between the wheel hub and alloy wheels. The result is a widened track, improved stance and an increased handling performance. ST spacers also give the impression of a wider rim. This is a simple and effective way to achieve a sportier appearance with tuneable driving dynamics. The ST spacers are available in black anodized aluminum. Bolt on system with patented center adapters for double centring for cars with wheel bolts AND threaded wheel studs. The double centring system guarantees an optimal fitment. Different center bores can be covered with the exchangeable center adapters. 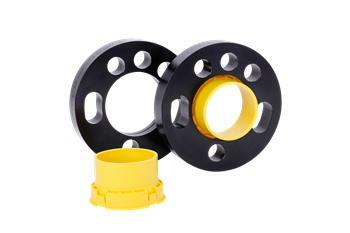 The wheel spacer is mounted to the wheel hub with the added mounting material. For cars with threaded wheel studs the ST threaded studs are used to mount the wheel to the wheel spacer. For cars with wheel bolts M14×1.5 bolts are used to mount the wheel on the wheel spacer. Additionally, a conversion from wheel bolts to threaded wheel studs is possible due to the ST threaded studs.